Are you as nuts about Pixar toys are we are? If so, you are in for treat! As you may know Pixar short characters are usually made into plush toys and are pretty hard to find. We should know we've been searching for the Boundin' box set for years now! 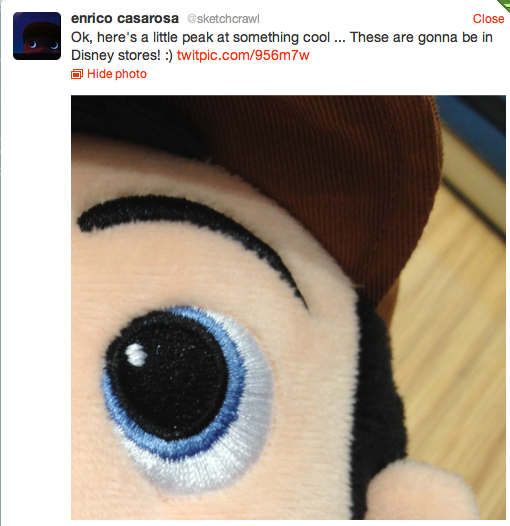 This tweet from the director of La Luna, Enrico Casarosa posts a photo of what appears to be a Bambino plush toy that should be on the shelves in Disney stores soon! Keep your eyes peeled and don't miss your chance to pick up this great toy.